I was nervous that I had come over too graphic designer on the envelope. It was late at night, there was a long European address involved, the postcode was not located within spitting distance of the bottom right hand corner and the posties at either end had to be somewhat challenged (not to say irked). And this scarf had taken quite some time, love and angst in the making. Available as a free Ravely download here the excellent Swiss Cheese Scarf does require a bit of fiddling. The small holes that happen either side of the really big (intentional) holes bothered me, although I know others don't seem to mind. About half way through I finally hit on my method of avoiding the holey-around-the-hole effect. 1. On the last two stitches before binding off for a hole, slip one, knit, pass slipped stitch over on to left needle and knit. This gives the 'anchor' point of the hole some extra strength. 2. Do the same after binding off 10 stitches (extra oomph for the other side). 3. When it comes to casting the hole bit back on, cast an extra stitch (so 11, not 10) then simply pass this stitch over the next stitch to be knit. 4. In the following row I did the slip 1, knit 1, pass slipped stitch over on to left needle and knit technique either side of each hole. Finally, I was chuffed to bits with the Eki Riva 100% Superbaby Alpaca 4ply I used on 3mm needles. The pattern allows for a really wiiiiiiiiiide scarf. 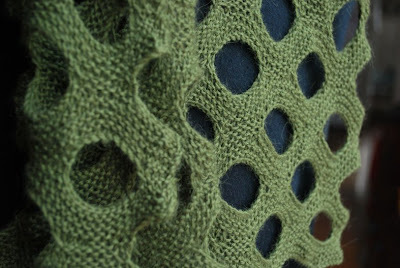 Mine is a 74 stitch cast on version, and after blocking (er, excuse the unfortunate pic below), it was plenty wide enough and way long enough with a great slightly spiderwebby lacy look. Just to confirm, EB, the true recipient, does not own whiskers. This tortured soul is the long-suffering, roped-in model. 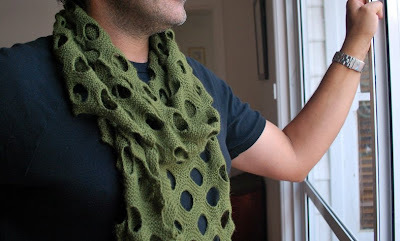 To prevent me from going completely insane searching, PLEASE send me a good link to this pattern - it ROCKS on the Mister, but I think I'd like it on me more - GRIN! Righto. First you have to sign up at Ravelry. That way, when you hit the link, and it takes you to the home page, you sign in, and THEN it should take you straight to the Swiss Cheese Scarf by Winnie Shih. Got all that?